Westcliff Open House Sunday, May 29, 2016. Sunday from 1 to 3 PM. Westcliff Lane, Reno, Nevada, great location, minutes to University of Nevada (UNR), downtown Reno, NV with easy access to HWY 80 and shopping. This spacious 4 bedroom, 2.5 bath home with over 2100 square feet, across Summit Ridge Park with city and mountain views will make a perfect home for you. Enjoy cooking in this efficiently designed kitchen equipped with plenty of cabinets, island, tile countertops, electric stove, microwave, pantry and garden window. The living room is light and bright with full southerly facing windows and a vaulted ceiling. There are hardwood floors in living & dining rooms with tile floors in entry and kitchen. The master bath includes separate tub and shower, double sink, walk-in closet. You can relax in the backyard on the private deck, waterfall, and small pond. 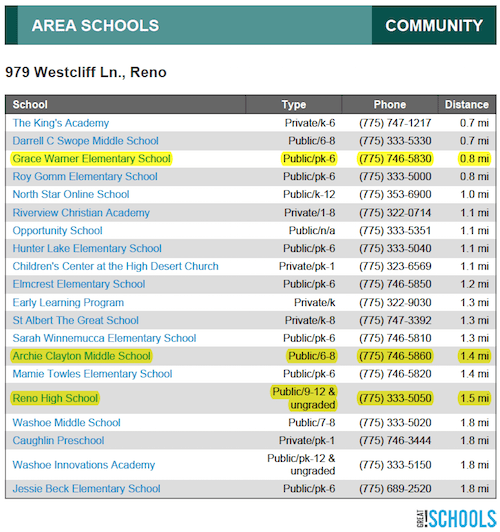 Schools for 979 Westcliff Ln, Reno, NV, are Grace Warner Elementary, Archie Clayton Middle School and Reno High School. Our oldest daughter, Kailey, attends Reno and is active in the band. We think very highly of Reno High and feel very good about the quality of teachers and the administration. Reno High is the oldest high school in Reno. 979 Westcliff Ln has a great location with easy freeway access to HWY 80, minutes to downtown Reno and convenient shopping.